Although hearing aid technology keeps getting better and better every year, there are still some situations where hearing aid users may need a little extra help. Whether you have difficulty on the phone, hearing the TV, or in background noise, there are accessories to help in almost every situation. 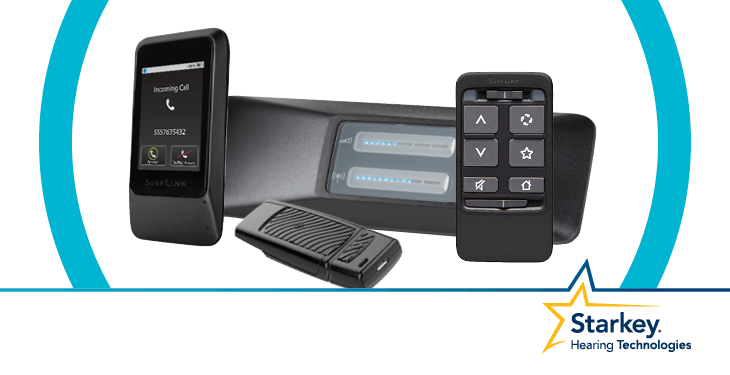 Remote controls can help users change volume and program settings wirelessly for one or both hearing aids. This makes changing settings more user-friendly and having to use often, small buttons on hearing aids. Some aids do not even have buttons so a remote is necessary to make these adjustments. One of our most recommended devices at The Hill Hear Better Clinic. There are many different shapes, sizes, and styles of remote mics but all serve the same purpose – to improve the signal-to-noise-ratio or SNR. By placing the microphone closer to what the hearing aid user wants to hear, these devices can remove distracting background noise and help a user concentrate on what they want to hear. Remote mics are often wirelessly connected to hearing aids but sometimes require an adapter/streamer to communicate with the hearing aids. They can be used for 1 on 1 conversation, in meetings, or at the dinner table in a noisy restaurant or family gathering. Streaming devices usually include products which connect to the hearing aids via a magnetic loop worn around the user’s neck. The streaming devices can directly connect via cable or via blue tooth to mobile phones, iPods/iPads, radios, televisions, or any other device that has blue tooth capability. For some hearing aids a streaming device is required to pair with other accessories such as a remote microphone. Streaming devices can sometimes also be used as remote controls. TV adapters give users the ability to hear the sound from the TV right through the hearing aids. Some work directly with the hearing aids and others work through streaming devices. This is all dependent on the manufacturer and model of the hearing aid. If use with hearing aids is not an option, there are Bluetooth headsets and wireless headphones like “TV Ears” to bring the TV directly to the user’s ears. Phone clips help patients to directly connect their hearing aids to a phone and be able to receive incoming calls through the hearing aids without holding the phone to the ear. It also limits the amount of background noise being picked up by the hearing aids while on a call. Typically, phone clips are used with mobile phones. 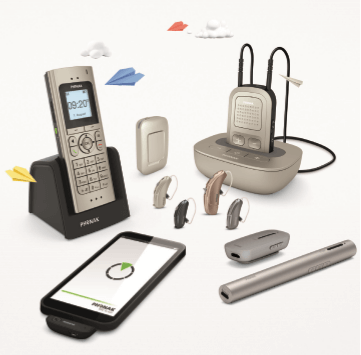 Special hearing aid phones have the ability to trigger an automatic setting in particular hearing aids which brings the sound from the phone not only through the phone receiver but also through the hearing aid directly, therefore putting the call directly in the user’s ear or ears. This is a great feature for those who struggle to hear the phone while wearing hearing aids. The only downside to this category is that not all manufacturers produce this type of product and is specific to the make and model of hearing aid. 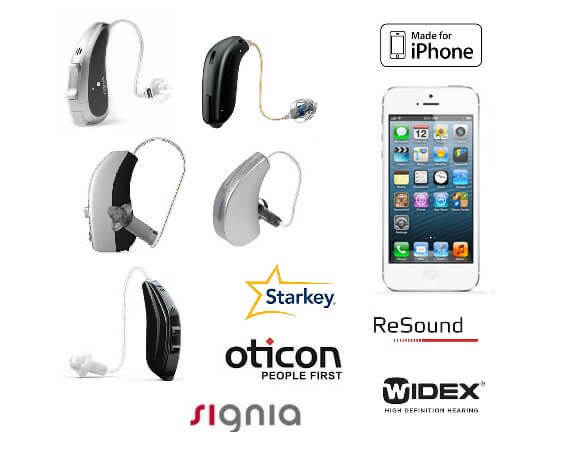 While almost any Bluetooth hearing aid accessory will pair with an iPhone there are specific hearing aids that are said to be “Made for iPhone”. Most major manufacturers have a product which is “Made for iPhone” and this option combines several categories of assistive devices into one. 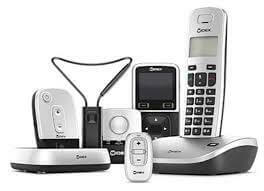 Remote control, remote microphone, streaming, and phone features are all functions operated by the phone. Not to mention the ability to set location-based programs to change hearing aid settings at selected locations. If you feel like any of these amazing options would be of benefit to you, please call us at The Hill Hear Better Clinic and schedule an appointment with one of our expert audiologists to find out what option or combination of options are best for you!